If you've read the paper below then you already know this, but I will summarize the key points and contrast them with the other two alternative views (simplified of course). Orthodox view: Othismos is literally a mass pushing match with the aim being to push opponents back until the cohesion of their battle-line breaks. In the most widely proposed form, the clash of hoplite phalanxes progressed along the following pattern: Both phalanxes charged at a slow run from about 200 meters apart. 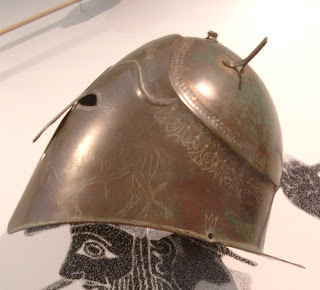 Hoplites move directly into shield-on-shield contact from the charge using the momentum to smash their shields together like rams and stabbing with spears underhand like cavalry lances. Spears are often shivered and opposing ranks become to some extent interlaced. This is followed by intense infighting with swords as ranks reform through a process not well explained and the ranks behind the front-rankers begin to push forward. It is this pushing phase that is labelled “othismos” (pushing) and the pushing is done side-on to the man in front with the left shoulder in the bowl of the shield. This othismos continues until one side gives way and collapses. Once one side collapses the victors pursue (but not too far) and the losers sustain many casualties. Heretical view: There are many variations of this, so I shall present it as I think most consistent with the hoplite panoply. The progress of battle differs from the orthodoxy in that there is no running charge directly into combat. They note that the run would cause disorder in the ranks that this would be counter to the whole idea of forming ranks in the first place. 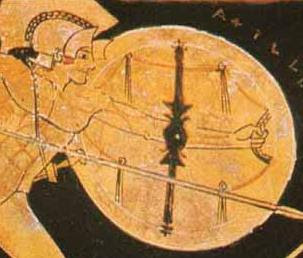 Combat occurs at spear's length, perhaps with shields overlapped, perhaps not, in a phase known to the Hellenistic Greeks as doratismos. Fighting might then progress to infighting with shield-bashing on an individual, uncoordinated scale. While the front-rankers and the one or two ranks behind them fight, the men to the rear provide only moral support and make ready to step over their corpses to take a place in the battle line. The advance of the phalanx is figuratively labelled “othismos” as we might speak of an armored "push" of tanks and mechanized infantry. Fighting occurs until one side gives way due to mounting casualties and morale failure. As before, the losing side suffers as the victors pursue. Othismos-crowd model: This view incorporates elements of both of the above. In my view there is a running charge from a couple hundred meters as in the view of the orthodoxy, but with spears held up overhand. This does not lead directly into othismos, for there is no crash of hoplites seeking to use momentum to bash into their foes, and thus no interlacing of opposing ranks. Front ranks pull up from the charge prior to shield contact with their foes, then close to the approximately 5' distance from their foes that reflects the reach of the dory, entering doratismos as in the heretic's view. They then spear fence en masse as envisioned by the heretics, but at a spacing of something less than 1 m frontage, their aspides just overlapped. Only the second rank uses their spears in support of the front rank. At some point there is a shift in phase to fighting at less than spear range. 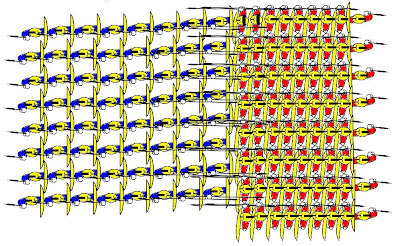 Closing to less than spear range would be natural if a hoplite’s spear was broken, for he would then find himself with the choice of standing in the ranks unable to reach the enemy, leaving the ranks to move in close, or staying in the ranks, but pressuring the men beside him to move in as a group. As more spears are lost this urging in close magnifies until the line moves. This describes how the move into close range could emerge without any central command, but it is possible that men were purposefully led into close range fighting. 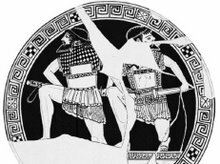 It is possible to move from advance to othismos without a spear-fencing stage, but it is unlikely that this occurred as the more recent formulations of the orthodoxy put forward, with men running into each other in an uncoordinated manner. In order to maximize force, the men must pack their files tight before they hit the enemy phalanx rather than run in directly from the charge. Spartans would have had an easier time of this due to their slower advance. However it occurs, when the opposing units are in close contact, the rear rankers close up behind those in front for physical support. 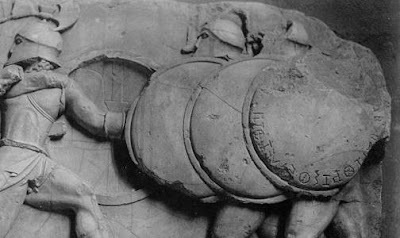 The weapons used by hoplites are well designed for this type of fighting over the top of the shield rims. The ranks continue to tighten until the men are belly to back with the men in front and behind. How long this takes can vary with training in a polis or over time, but eventually this compact mass enters the othismos phase of battle. If the opposing front rankers are already shield to shield, then the progression to othismos is gradual and fluid. If they are at a distance, then there is a short and shuffling charge by the whole mass (as seen in the videos on this site). The two phalanxes now function like crowds, generating intense force as they push against each other. Men in the middle of the mass do not control their own movement, but ride the waves of flesh, all the while fighting and defending with sword or broken spear in their upraised right arm. The pressure is enough that these men would be asphyxiated without the aspis. If shields break under the pressure men die, unless they can breathe within the bowl of the overlap of the man to their right's shield. There may be lulls in the combat where the opposing phalanxes loosen this tight level of packing due to exhaustion, the front men may still be fighting or they too may pull apart. Eventually one side gives way and the same pursuit seen in the other models occurs. As you see, my model incorporates the possibility of extended initial doratismos with literal othismos. My othismos is a far more brutal thing than that described by the orthodoxy. The momentum of men charging at 5 mph produced forces that are similar to the maximum seen in the crowd-crush. More importantly, individual collisions are also instantaneous, lasting a few miliseconds, while the pressure within crowds can be maintained for extended periods and is far more lethal. 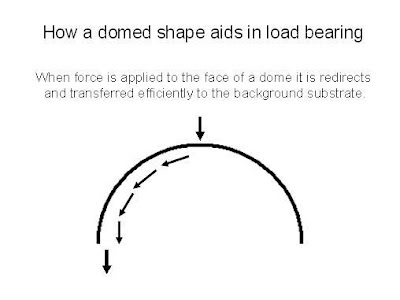 Men pushing side-on with the shoulder in the shield cannot generate the enormous crowd-like crushing forces that men pushing belly to back can. 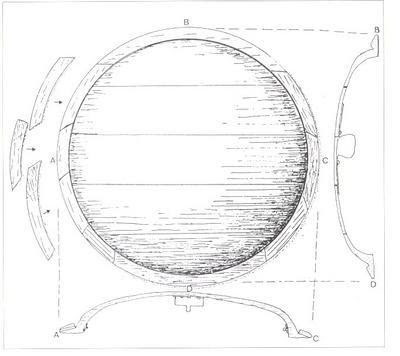 As the pressure builds, side-on men will collapse to belly to back if there is room to, and if there is no space between them and the men beside them, then they are vulnerable to asphyxia since their diaphragm is not in the belly of the shield. To a buzzard circling the battlefield othismos would look like this, with only the rear rankers able to push sideways. 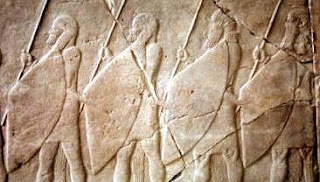 If we compare a side-on to belly to back postures of hoplites n the phalanx, you will see the difference in the density of the crowd packing, though the side-on man have a more narrow frontage. Under pressure these sideways men will collapse to face forward, absorbing the force of the men pushing them from behind instead of transferring it to the man in front of them. 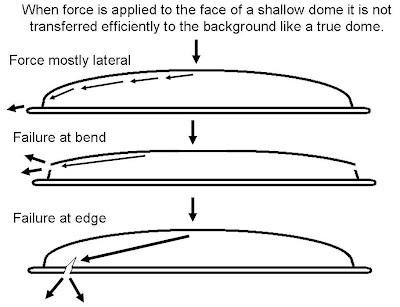 The pushing forces generated by a crowd can be greater than the smashing force of an initial running collision of shields, and there is no disruption of order from interlacing front ranks. As I am able I will add more comparative details of the mechanics. So far I have not leaned heavily on primary sources, but I am putting together a post in which I shall interpret the words of ancient authors to support my position, just as both the heretics and orthodoxy have used alternate interpretations of many of the same quotes to support their position and rule out the other.